France became the first visiting side to win a Test series in South Africa since 1896, beating the Springboks 9-5 in Johannesburg in the final match of a two-Test series. France skipper Lucien Mias was a revelation, branded by the South African press as "the best international forward ever to be seen in South Africa". The Sunday Express ran a headline the following morning that read simply - "At Ellis Park, a man cried". New Zealand retained the Tri Nations trophy by beating Australia 36-24 in a match in which, remarkably, all of the points are scored at the same end of the ground. The All Blacks led 36-0 at half-time, thanks to tries from Taine Randell, Justin Marshall and Christian Cullen, but the Wallabies fought back to give the score-line some respectability. Stephen Larkham scored a brace, with Ben Tune and Joe Roff also bagging tries. New Zealand took a stranglehold on the Tri-Nations with a 19-0 victory over South Africa at Newlands in Cape Town. World champions South Africa were unable to mark Percy Montgomery's 100th appearance with a victory as the All Blacks gained a valuable advantage. Conrad Smith, Dan Carter and Keven Mealamu scored All Black tries as the Springboks were kept scoreless. Bennie Osler's drop goal was the difference between South Africa and the Lions in the first Test in Durban, where the score-line in favour of the Springboks was 7-3. Wing Hans Aucamp scored a try for the hosts, with England flanker Arthur Blakiston's try the only score for the tourists. The new Ranfurly Shield holders, Auckland, were beaten 17-16 by the touring Wallabies in a thriller at Eden Park. The home side surrendered a 16-8 half-time lead and lost to a late dropped goal by Aussie skipper John Solomon. 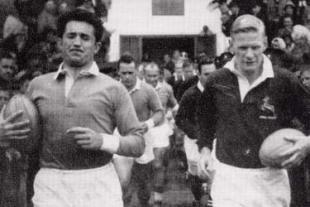 The Western Province Universities tested Robin Thompson's Lions in Cape Town. The visitors had to call on all their experience to hold off the students 20-17 at Newlands. In the 26th and final match of their tour, the Lions were beaten 25-21 in Suva by the Fijian national team. The hosts outscored Phil Bennett's team by five tries to three, Bennett himself contributing one of the tries as well as kicking three conversions and a penalty.